GTIN-13 number encoded in EAN-13 barcode. The first digit is always placed outside the symbol; additionally a right ">" indicator is used to indicate a "Quiet Zone" that is necessary for barcode scanners to work properly. The International Article Number (also known as European Article Number or EAN) is a standard describing a barcode symbology and numbering system used in global trade to identify a specific retail product type, in a specific packaging configuration, from a specific manufacturer. The standard has been subsumed in the Global Trade Item Number standard from the GS1 organization; the same numbers can be referred to as GTINs and can be encoded in other barcode symbologies defined by GS1. 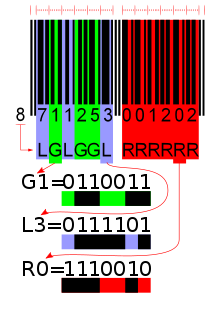 EAN barcodes are used worldwide for lookup at retail point of sale, but can also be used as numbers for other purposes such as wholesale ordering or accounting. The most commonly used EAN standard is the thirteen-digit EAN-13, a superset of the original 12-digit Universal Product Code (UPC-A) standard developed in 1970 by George J. Laurer. An EAN-13 number includes a 3-digit GS1 prefix (indicating country of registration or special type of product). A prefix with a first digit of "0" indicates a 12-digit UPC-A code follows. A prefix with first two digits of "45" or "49" indicates a Japanese Article Number (JAN) follows. The less commonly used 8-digit EAN-8 barcode was introduced for use on small packages, where EAN-13 would be too large. 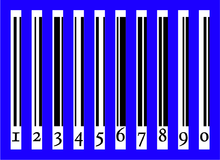 2-digit EAN-2 and 5-digit EAN-5 are supplemental barcodes, placed on the right-hand side of EAN-13 or UPC. These are generally used for periodicals like magazines or books, to indicate the current year's issue number; and weighed products like food, to indicate the manufacturer's suggested retail price. The first three digits of the EAN-13 (GS1 Prefix) usually identify the GS1 Member Organization which the manufacturer has joined (not necessarily where the product is actually made). Note that EAN-13 codes beginning with 0 are actually 12-digit UPC codes with prepended 0 digit. In the last few years, more products sold by retailers outside United States and Canada have been using EAN-13 codes beginning with 0, since they were generated by GS1-US. The 020-029 GS1 Prefixes are worth a special mention. GS1 defines this as being available for retailer internal use (or internal use by other types of business). Some retailers use this for proprietary (own brand or unbranded) products, although many retailers obtain their own manufacturer's code for their own brands. Other retailers use at least part of this prefix for products which are packaged in store, for example, items weighed and served over a counter for a customer. In these cases, the barcode may encode a price, quantity or weight along with a product identifier - in a retailer defined way. The product identifier may be one assigned by the Produce Electronic Identification Board (PEIB) or may be retailer assigned. 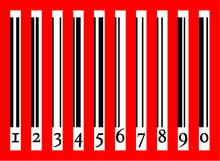 Retailers who have historically used UPC barcodes tend to use GS1 prefixes starting with "02" for store-packaged products. The EAN "country code" 978 (and later 979) has been allocated since the 1980s to reserve a Unique Country Code (UCC) prefix for EAN identifiers of published books, regardless of country of origin, so that the EAN space can catalog books by ISBNs rather than maintaining a redundant parallel numbering system. This is informally known as "Bookland". The prefix 979 with first digit 0 is used for International Standard Music Number (ISMN) and the prefix 977 indicates International Standard Serial Number (ISSN). The manufacturer code is a unique code assigned to each manufacturer by the numbering authority indicated by the GS1 Prefix. All products produced by a given company will use the same manufacturer code. EAN-13 uses what are called "variable-length manufacturer codes". Assigning fixed-length 5-digit manufacturer codes, as the UCC has done until recently, means that each manufacturer can have up to 99,999 product codes. Many manufacturers do not have that many products, which means hundreds or even thousands of potential product codes are being wasted on manufacturers that only have a few products. Thus if a potential manufacturer knows that it is only going to produce a few products, EAN-13 may issue it a longer manufacturer code, leaving less space for the product code. This results in more efficient use of the available manufacturer and product codes. The product code is assigned by the manufacturer. The product code immediately follows manufacturer code. The total length of manufacturer code plus product code should be 9 or 10 digits depending on the length of country code (2-3 digits). In ISBN, ISMN and ISSN, it uniquely identifies the publication from the same publisher; it should be used and allocated by the registered publisher in order to avoid creating gaps; however it happens that a registered book or serial never gets published and sold. The check digit is an additional digit, used to verify that a barcode has been scanned correctly. It is computed modulo 10, where the weights in the checksum calculation alternate 3 and 1. In particular, since the weights are relatively prime to 10, the EAN-13 system will detect all single digit errors. It also recognizes 90% of transposition errors (all cases, where the difference between adjacent digits is not 5). The checksum is calculated as sum of products - taking an alternating weight value (3 or 1) times the value of each data digit. The checksum digit is the digit, which must be added to this checksum to get a number divisible by 10 (i.e. the additive inverse of the checksum, modulo 10). See ISBN-13 check digit calculation for a more extensive description and algorithm. The Global Location Number(GLN) also uses the same method. The weight at a specific position in the EAN code is alternating (3 or 1) in a way, that the final data digit has a weight of 3 (and thus the check digit has a weight of 1). Numbering the positions from the right (code aligned to the right), the odd data digits are always weight of 3 and the even data digits are always weight of 1, regardless of the length of the code. The nearest multiple of 10 that is equal or higher than the checksum, is 90. Subtract them: 90 - 89 = 1, which is the check digit x of the barcode. The nearest multiple of 10 that is equal or higher than the checksum, is 70. Subtract them: 70 - 63 = 7, which is the check digit x of the barcode. The GTIN numbers, encoded to UPC-A, EAN-8 and EAN-13, all use similar encoding. The encoded data is usually repeated in plain text below the barcode. To encode the 13-digit EAN-13 number, the digits are split into 3 groups; the first digit, the first group of 6 and the last group of 6. The first group of 6 is encoded using a pattern whereby each digit has two possible encodings, one of which has even parity (denoted with letter G) and one of which has odd parity (denoted with letter L). The first digit is not represented directly by a pattern of bars and spaces, but is encoded indirectly, by selecting a pattern of choices between these two encodings for the first group of 6 digits, according to the table below. All digits in the last group of 6 digits are encoded using a single pattern RRRRRR, the one also used for UPC. If the first digit is zero, all digits in the first group of 6 are encoded using the pattern LLLLLL used for UPC, therefore, an UPC barcode is also an EAN-13 barcode with the first digit set to zero. This encoding guarantees that the first group always starts with an L-code, which has odd parity, and that the second group always starts with an R-code, which has even parity. Thus, it does not matter whether the barcode is scanned from the left or from the right, as the scanning software can use this parity to identify the start and end of the code. Note: Entries in the R-column are bitwise complements (logical operator: negation) of the respective entries in the L-column. Entries in the G-column are the entries in the R-column in reverse bit order. See pictures of all codes against a colored background. A run of one or more black areas is known as a "bar", and a run of one or more white areas is known as a "space". As can be seen in the table, each digit's encoding comprises two bars and two spaces, and the maximum width of a bar or space is four areas. EAN-13 barcode. A green bar indicates the black bars and white spaces that encode a digit. 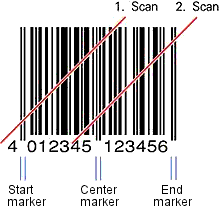 C2: Marker for the center of the barcode. 6 digits in the left group: 003994. 6 digits in the right group (the last digit is the check digit): 155486. A digit is encoded in seven areas, by two black bars and two white spaces. Each black bar or white space can have a width between 1 and 4 areas. Parity for the digits from left and right group: OEOOEE EEEEEE (O = Odd parity, E = Even parity). The first digit in the EAN code: the combination of parities of the digits in the left group indirectly encodes the first digit 4. The complete EAN-13 code is thus: 4 003994 155486. Scanning part of an EAN-13 barcode. By using the barcode center marker, it is possible for a barcode scanner to scan just one half of the barcode at a time. This allows reconstruction of the code by means of a helical scan of the barcode by an angle of approximately 45 degrees. Japanese Article Number (JAN) is a barcode standard compatible with the EAN. Use of the JAN standard began in 1978. Originally, JAN was issued a flag code (EAN's number system) of 49. In 1992, JAN was newly issued an additional flag code of 45. In January 2001 the manufacturer code changed to 7 digits (9 digits including the flag code) for new companies. ^ "Alumni Hall of Fame Members". University of Maryland Alumni Association. The University of Maryland. 2005. Archived from the original on 2007-06-23. Retrieved 2009-06-10. After graduating from Maryland in 1951, George Laurer joined IBM as a junior engineer and worked up the ranks to senior engineer. In 1969, he returned to the technical side of engineering and was later assigned the monumental task of designing a code and symbol for product identification for the Uniform Grocery Product Code Council. His solution — the Universal Product Code — radically changed the retail world. Since then, he has enhanced the code by adding a 13th digit. Laurer retired from IBM in 1987. He holds some 25 patents and is a member of the university’s A. James Clark School of Engineering Hall of Fame. 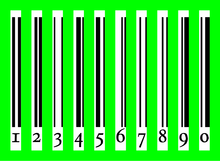 ^ a b "Barcodes for Books". ^ Prefix List, GS1 . ^ Check Digit Calculator, at GS1 US. ^ "Infos zu EAN Codes Nummern" (in German). Ean-code.eu. Retrieved 27 September 2016. ^ "Bar Code Guide - Barcode Types - JAN". Retrieved 2016-05-02. Wikimedia Commons has media related to International Article Number (EAN).